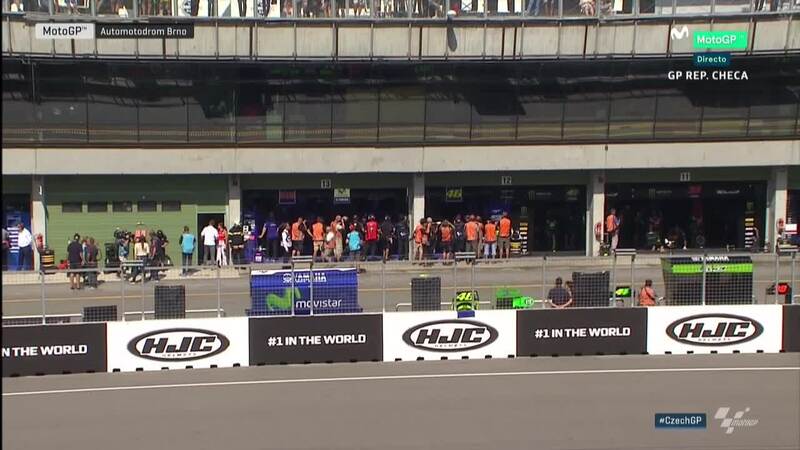 Repsol Honda Team’s Dani Pedrosa topped Q1 in the Czech Republic after the Spaniard just found himself out of the top ten on combined practice times. 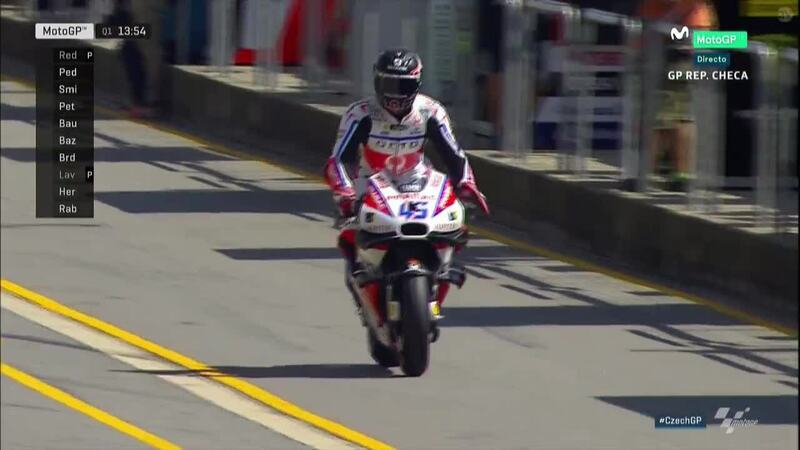 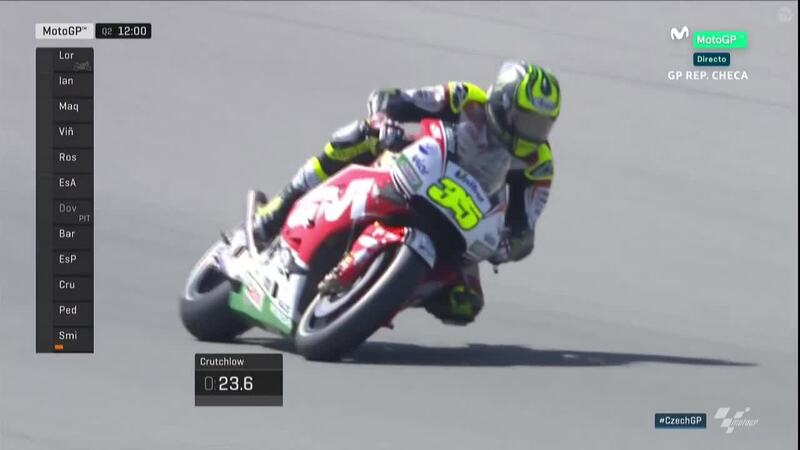 After crossing the line P7 in FP4, the 3-time world champion then put in a solid few laps to top the Q1 session with ease, unthreatened after his first flyer. 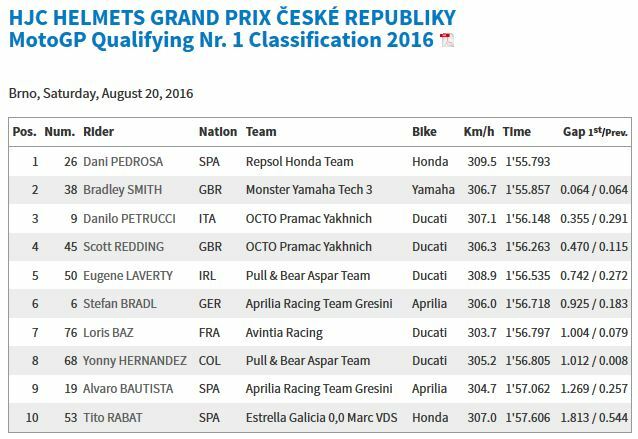 Bradley Smith (Monster Yamaha Tech 3) was the second fastest rider in Q1 by only a tiny margin, and will also graduate to Q2 to fight for the top 12 grid positions for the HJC Helmets Grand Prix České Republiky. 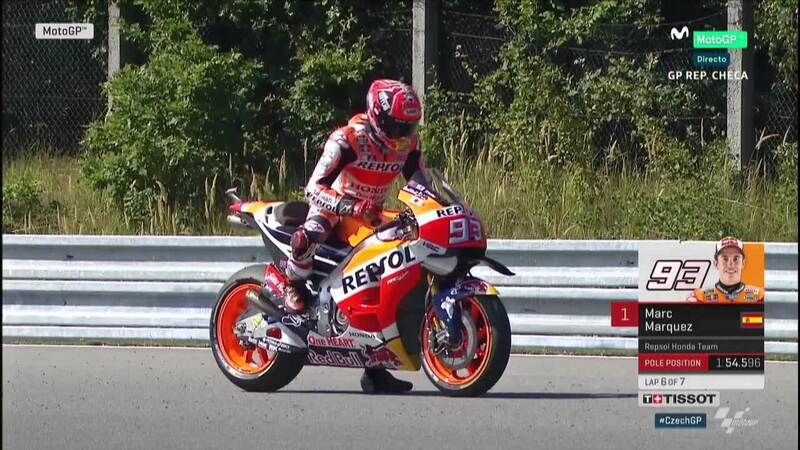 Marc Marquez (Repsol Honda Team) has taken pole position in Brno, as the points leader in the title fight left it late to overcome an ominous-looking Jorge Lorenzo (Movistar Yamaha MotoGP) in the final minutes of Q2. 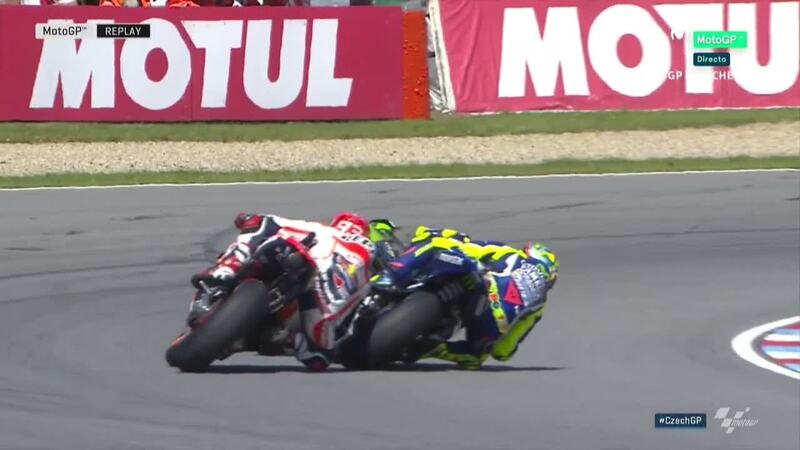 Marquez, who topped Friday but had since been overshadowed by compatriot Lorenzo in FP3 and FP4, pulled out an incredible laptime in the session – including overtaking the provisional polesitter’s Yamaha teammate Valentino Rossi into the final corner in a spectacular move. 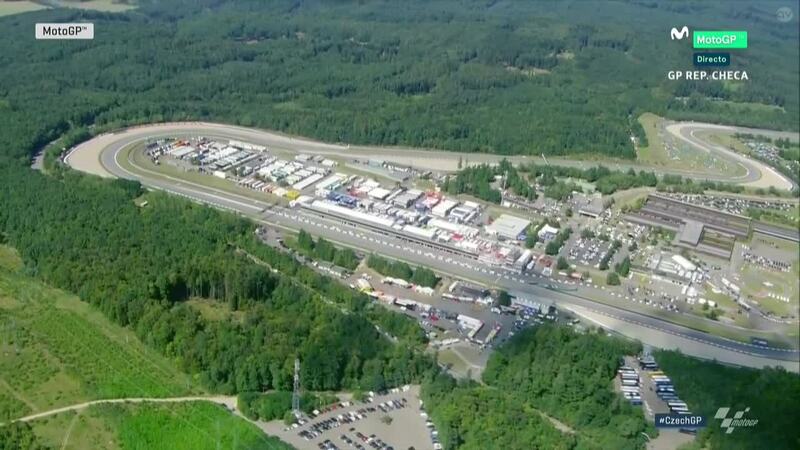 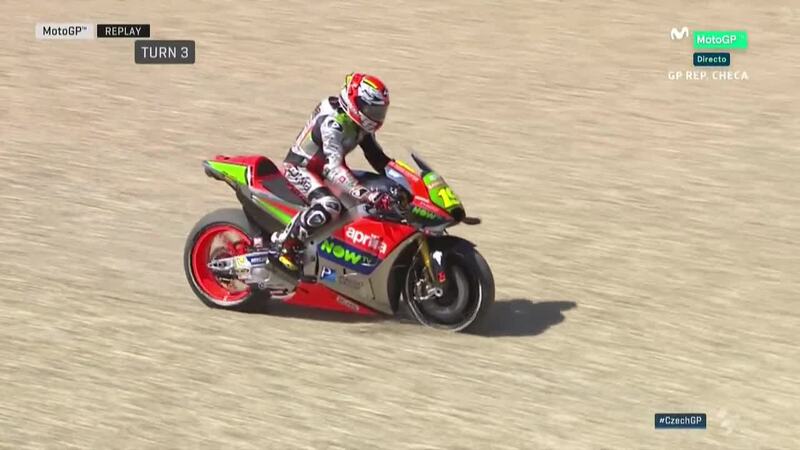 Poleman last time out Andrea Iannone (Ducati Team) completes the front row in P3. 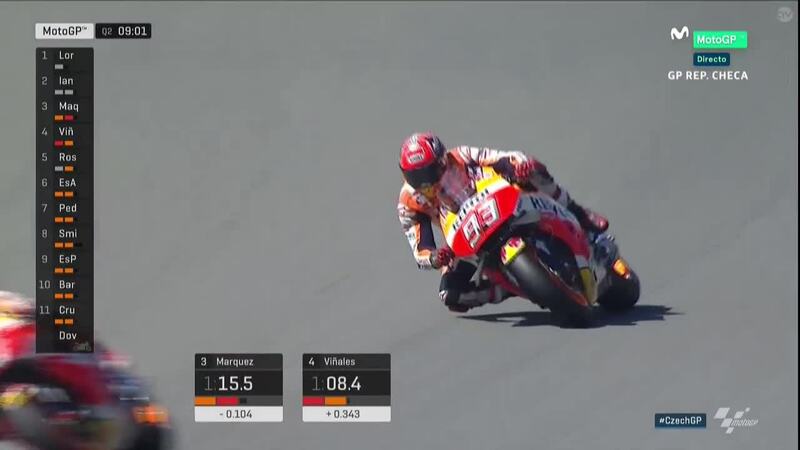 Marquez had an orange first sector after Lorenzo’s second attempt saw him move further clear at the top, before the timing screens went red in sector 2 and 3 – with the final part of the track the decider. 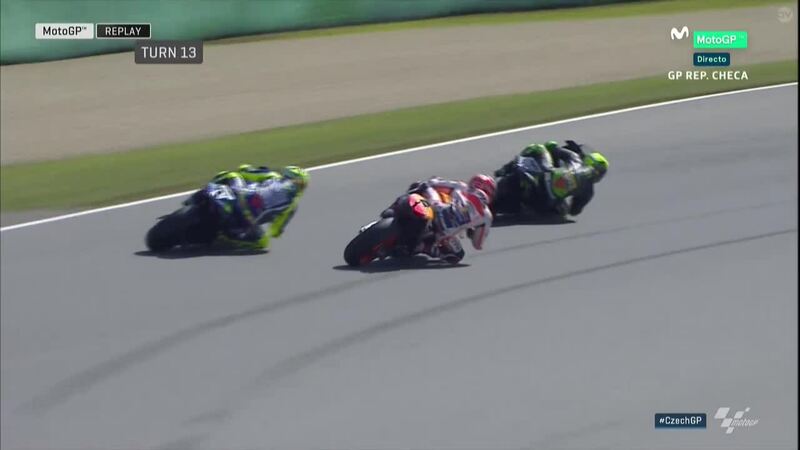 With two tenths to play with, Marquez came up behind the Monster Yamaha Tech 3 of Pol Espargaro and Movistar Yamaha of Valentino Rossi at the final corner – and slotted between the two through the final apex. 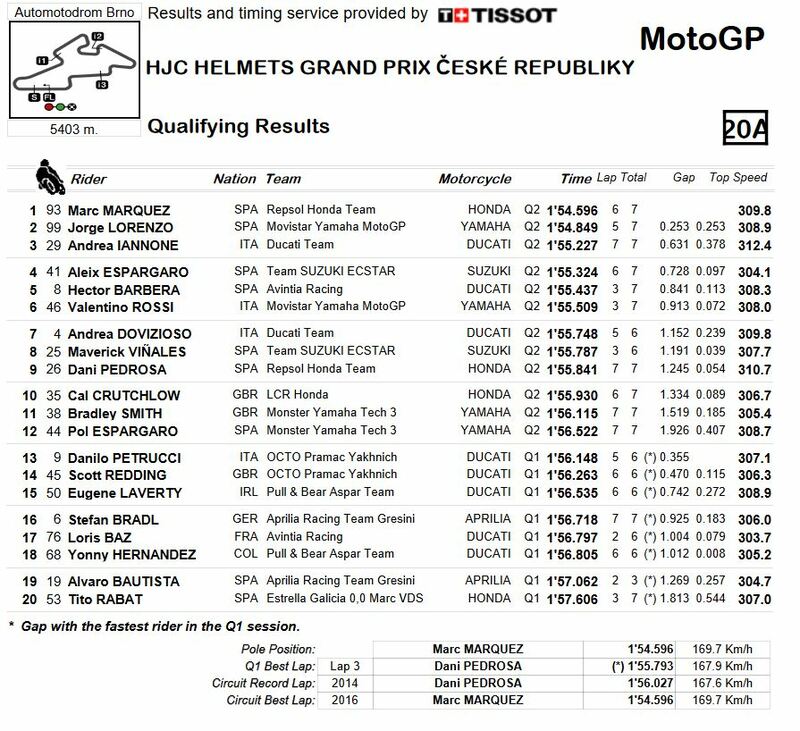 Jorge Lorenzo has shown sublime form all Saturday in Brno, including proving the first man to break the lap record in FP3, and also topped FP4 before just losing the pole position to compatriot and championship rival Marc Marquez. 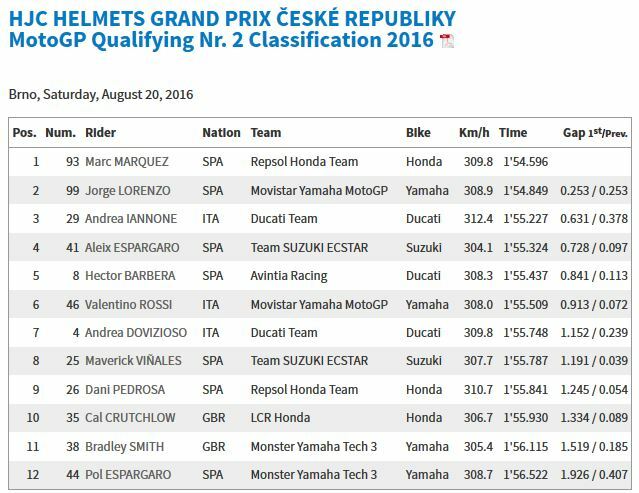 Lorenzo’s race pace looks ominous however, with memories of Brno 2015 also sure to be high in rivals’ minds. 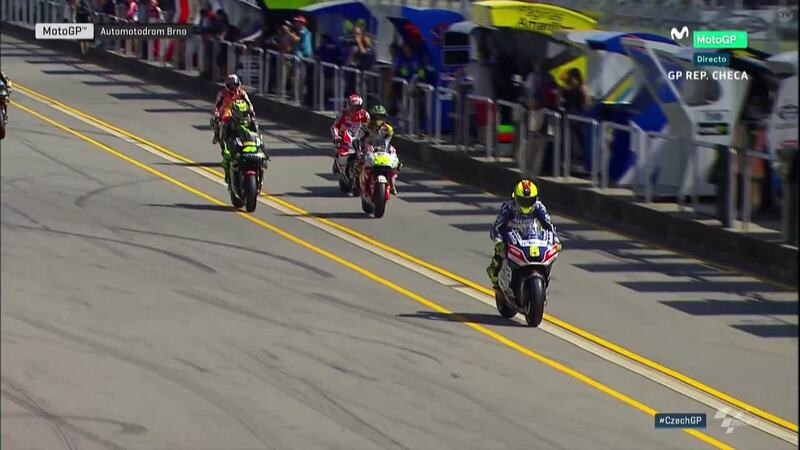 Andrea Iannone had an up and down Saturday before just pipping Aleix Espargaro (Team Suzuki Ecstar) to complete the front row, with a technical issue earlier in the day and a crash. 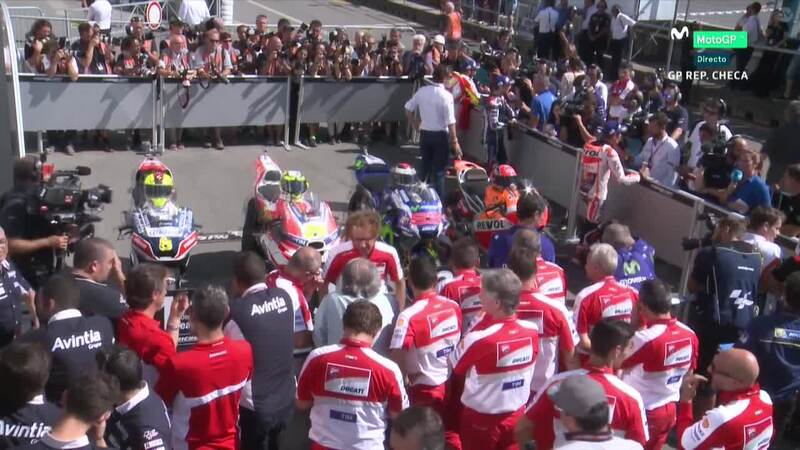 Iannone was the last man to cross the line and had to wheel the bike back up pitlane to parc ferme after not having realized how far up the grid he had qualified. 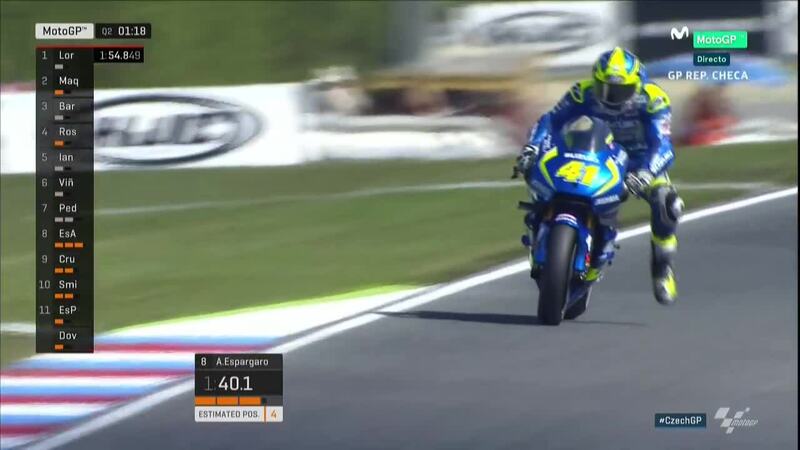 Behind Espargaro in P5 was Hector Barbera (Avintia Racing), who recovered from a difficult FP3 for a great qualifying result. 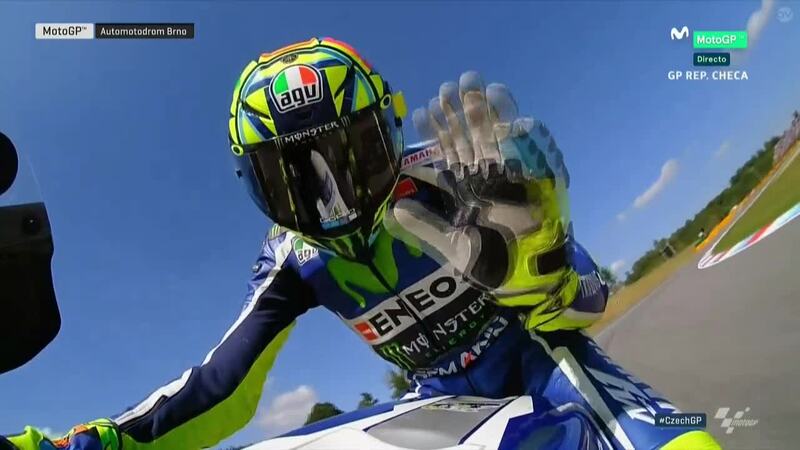 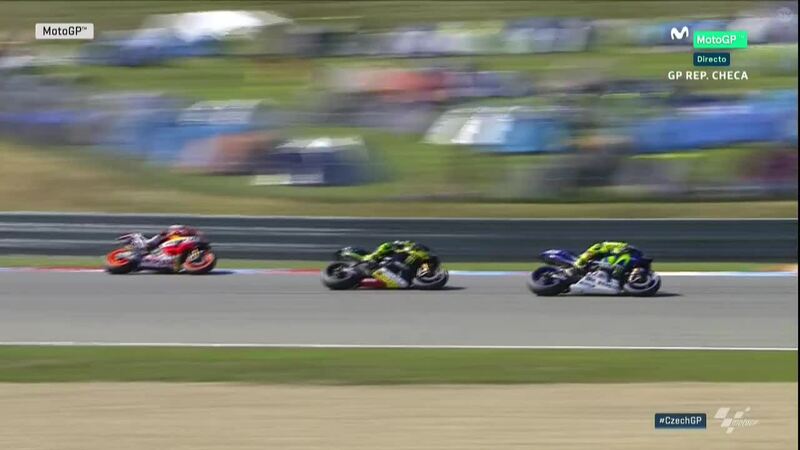 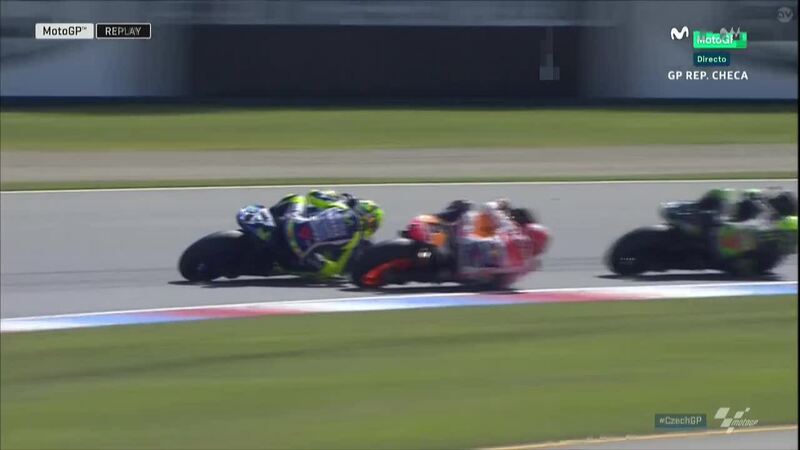 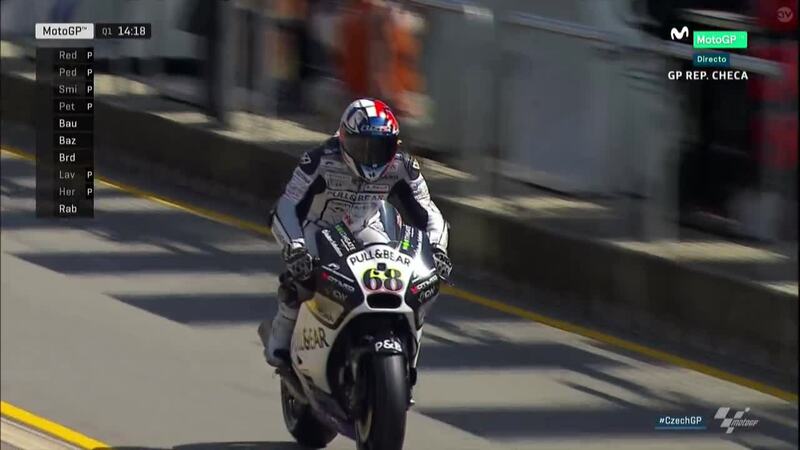 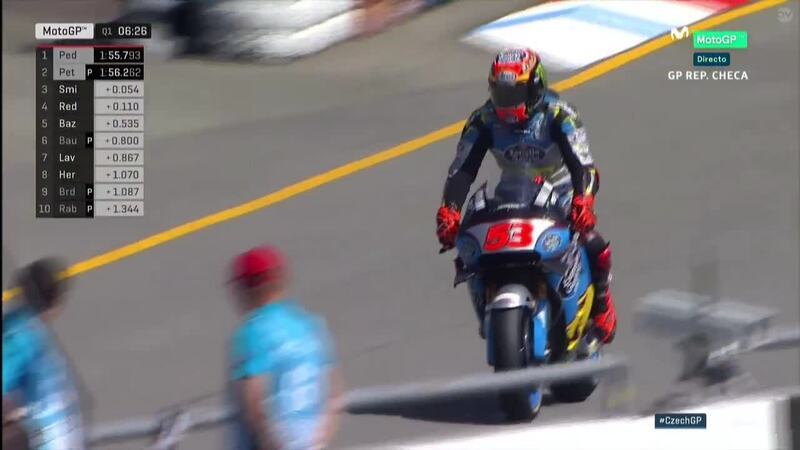 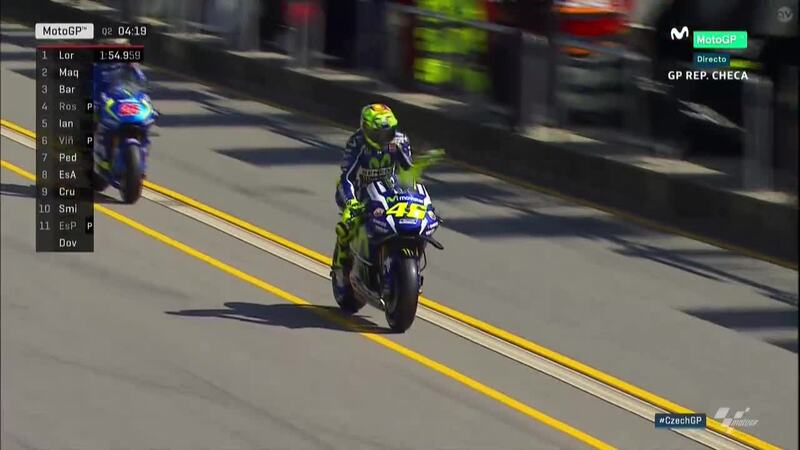 The Spaniard beat 9-time world champion Valentino Rossi to the top 5, as the Italian completes row 2 in P6. 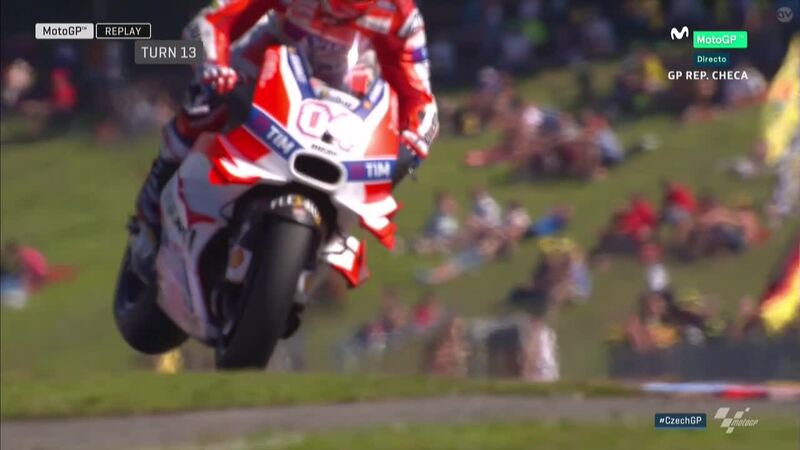 Andrea Dovizioso (Ducati Team) had a number of issues in the session and got out of sync as he changed the front tyre and tried to make the best of the limited time, but managed a P7 result ahead of the second Team Suzuki Ecstar machine of Maverick Viñales. 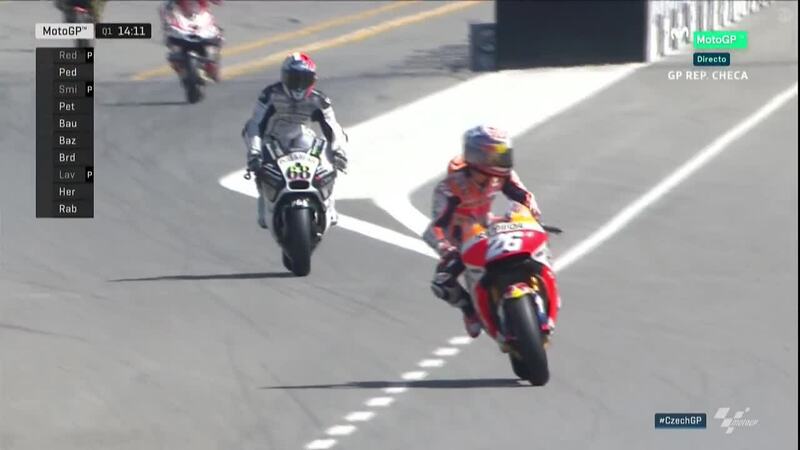 Repsol Honda rider Dani Pedrosa completes the third row in P9 after moving up from Q1, ahead of LCR Honda rider Cal Crutchlow to round out the top ten. 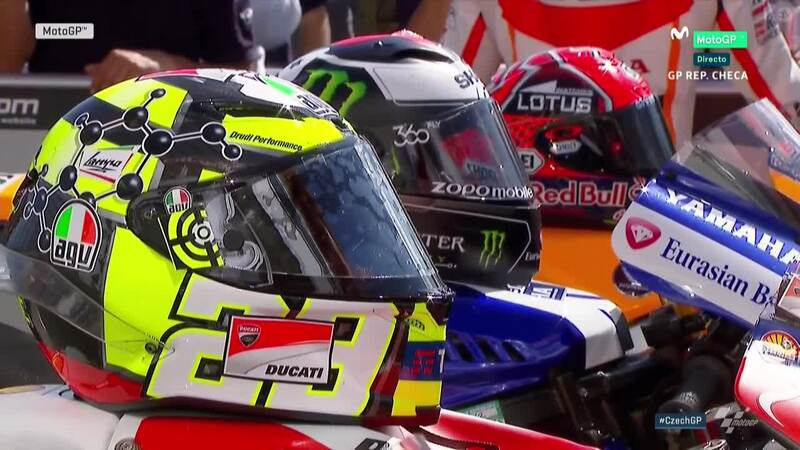 Marquez’ pole takes the Spaniard equal on pole positions with Movistar Yamaha MotoGP pairing Jorge Lorenzo and Valentino Rossi, with the top 3 men in the title fight now – incredibly – tied on a record 63 pole positions each across all classes…sharing the honours, for once, at the top of the table.